THE BRITISH RAILWAY STORIES LTD: "A Sunday afternoon with a Gresley N2...69522"
Sir Nigel Gresley's N2 class 0-6-2T locomotives are one of the most handsome tank locomotives ever built. 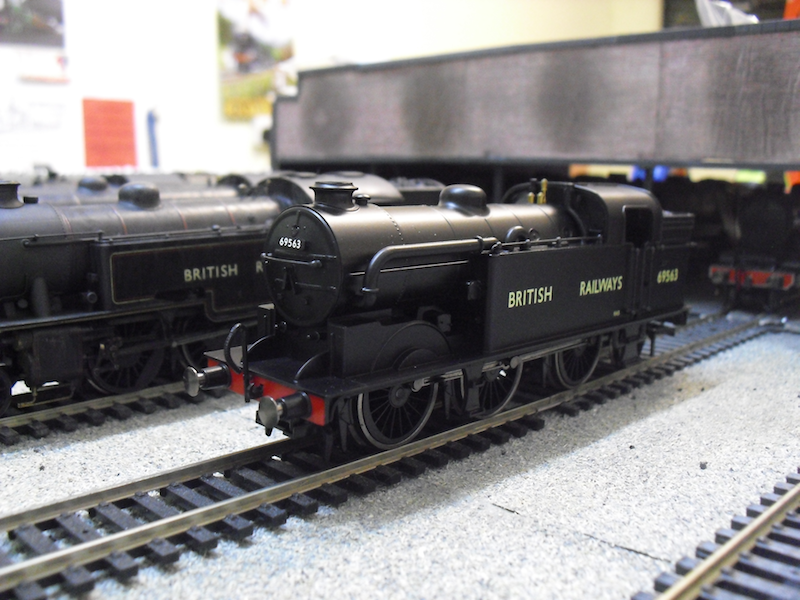 Powerful, rugged, and distinctive, they were effectively a development of Ivatt's similar (but smaller boilered) earlier N1 class locomotives of 1907 (I plan on modelling the latter as well as the former, but more on that at a later date). The Great Northern Railway initially built sixty of these suburban tank locomotives, ten at Doncaster and the rest at North British. All of these locomotives had condensing gear and short chimneys, and right hand drive, and all were in service by the end of 1921. The London & North Eastern Railway then built a further forty seven to add to the original sixty, bringing the class numbers up to 107. The class worked throughout the southern section of the East Coast Main Line, and a selection of the class worked West Riding and Scottish services throughout their lives, eventually being displaced by Gresley's V1 and V3 classes. One has been preserved, no.1744 as seen above at the Mid Hants Railway in 2011. For both of my planned new layouts, the Gresley N2 has an important role to play, whether it's condensing fitted versions or non-condensing fitted N2s. They will pull a variety of suburban stock, mostly ready to run Gresley and Thompson vehicles from Hornby, but I am planning to build a few quad-arts (which are absolutely necessary for Ganwick Curve). 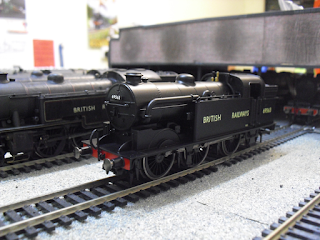 With that in mind, you will recall that recently I wrote something of a mini review on Hornby's Gresley N2, split from their Olympics 1948 train pack. It's a terrific model, but it required renumbering as it is a condensing fitted locomotive, intended for use in London on the Metropolitan line, and not suitable for the number Hornby picked (a non condensing N2 built for use in Scotland). I therefore plucked up the courage, and had a go this afternoon. One thing clear to me was that my choice of renumbering for my four London based N2s was very limited. I have only been able to find photographs of four of these locomotives with "British Railways" branding on the cabsides, in unlined black, though I am sure there must be a good deal more who had that combination. In a rare twist, neither the appropriate Yeadon's Register nor RCTS volume 9A was particularly helpful on this occasion, although it fell to the former to provide me with the first N2 for the stockist: no.69522. This was somewhat helpful as it meant only changing the two digits, using the now standard technique of some T-Cut colour restorer, applied liberally with a cotton bud and careful rubbing down thereafter. There was more work to do at the front end, however. 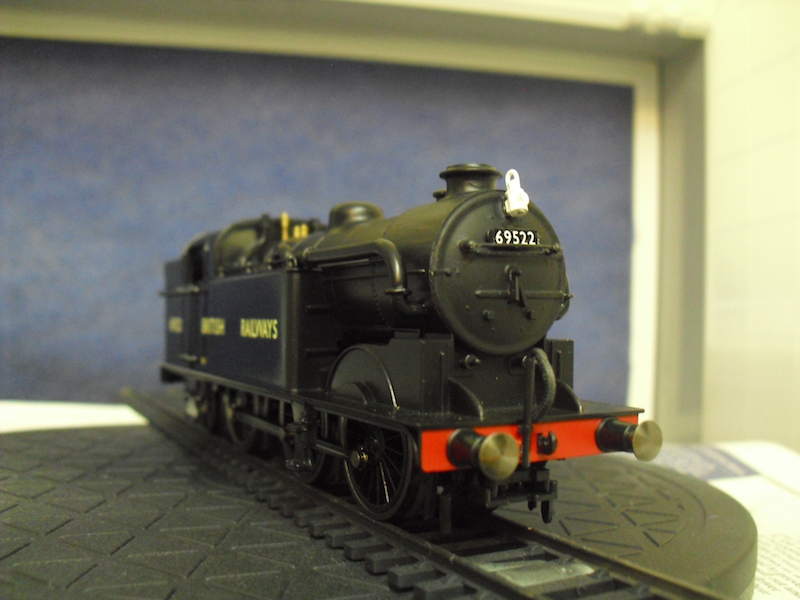 The photograph in Yeadon's Register showed that the handrail on no.69522 was above the upper smokebox door strap, not below it as on Hornby's model. 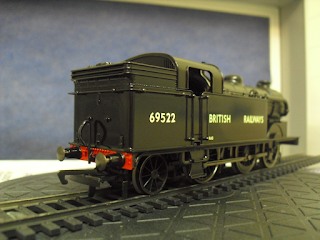 I simply hand drilled two new holes, filled in the old ones using Humbrol plastic model filler, carefully sanding the excess away with a foam wet'n'dry pad, and then painted the smokebox door using Gamesworkshops acrylic Abaddon Black. I changed the smokebox number by carefully cutting out individual numbers from a Fox transfers sheet. they are slightly bigger than Hornby's numerals, which is no bad thing as they look to be much closer to scale size. After placing the waterside transfers on the smokebox numberplate, and the newly added Fox Transfers numeral 2s onto the bunker sides, I allowed the model to dry before applying a few coats of Johnson's Klear via airbrush directly onto the tank and bunker sides to seal them onto the model. A single LNER pattern lamp from the Springside range was glued to the upper lamp bracket. A destination headboard for the smokebox door brackets is on order, amongst a variety of others. 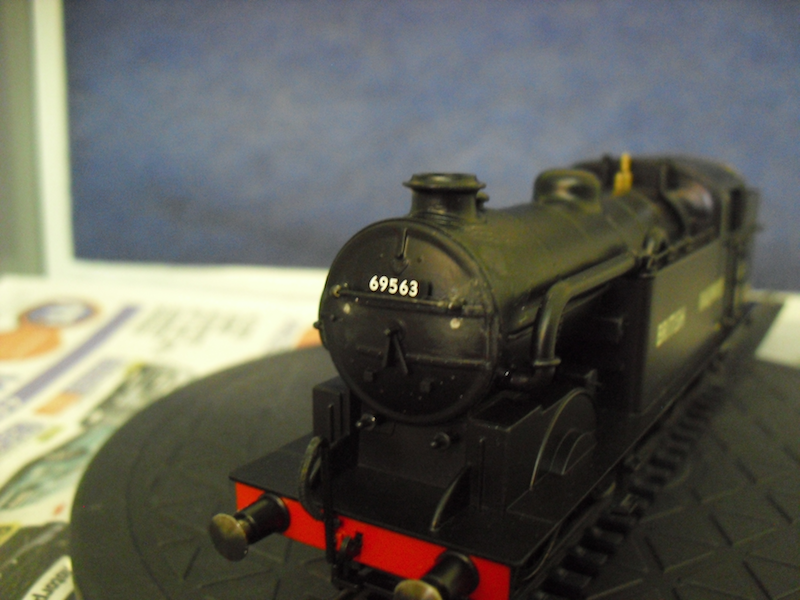 The result is a very clean no.69522, which we will put right in a future blog on weathering. 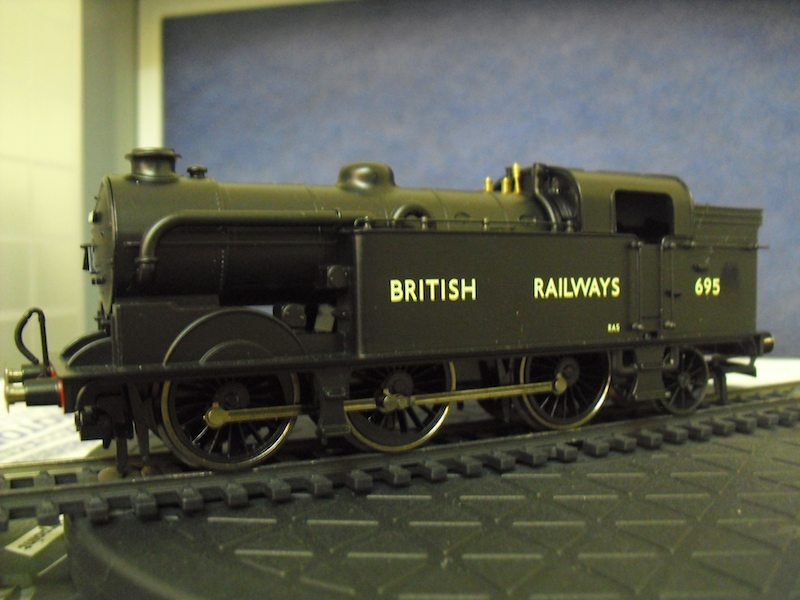 I have three more of these particular Hornby N2s to renumber and modify. The quick and relaxing Sunday afternoon spent sorting this one has convinced me that it's probably best to get them all done this way before sending them all to the weathering booth, en-masse, for a bit of grime!